Eighth Grade – The Sundance London, & San Francisco International Film Fest Audience Award winner, is Held Over for a 4th Week! The Children Act – From BAFTA winning director Richard Eyre, starring 2x Oscar winner Emma Thompson, and 2x Golden Globes winner Stanley Tucci! Mama Mia! Here We Go Again – The hit ABBA musical sequel, starring 3x Oscar winner Meryl Streep, and Oscar winner Colin Firth!! 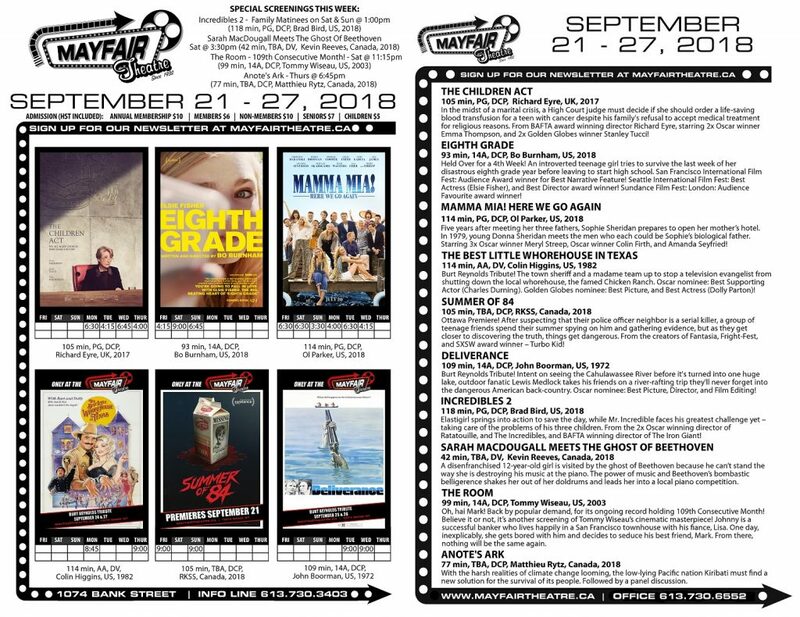 Summer of 84 – Ottawa Premiere of the latest from the creators of the Fantasia, Fright-Fest, and SXSW winner, Turbo Kid! Incredibles 2 – Family Matinees of the latest Disney / Pixar adventure, from the director of Ratatouille, The Incredibles, and The Iron Giant! The Room – Our ongoing record holding 109th Consecutive Month screening Tommy Wiseau’s late-late show cinematic masterpiece! The Best Little Whorehouse in Texas, and Deliverance – A rare chance to catch these modern classic films on the big screen, in honour of the late-great Burt Reynolds! Plus, a pair of special single screening rental presentations: Sarah MacDougall Meets the Ghost of Beethoven, and Anote’s Ark!